"This little light of mine, I'm gonna' let it shine! Let it shine, let it shine, let it shine." Imagine children lustily singing the above lines which eventually became a civil rights anthem. Their innocence and happy resolve enlightens us. Yes! In the face of wars, refugee crises, weapon proliferation and unaddressed climate change impacts, let us echo the common sense of children. Let goodness shine. Or, as our young friends in Afghanistan have put it, #Enough! They write the word, in Dari, on the palms of their hands and show it to cameras, wanting to shout out their desire to abolish all wars. 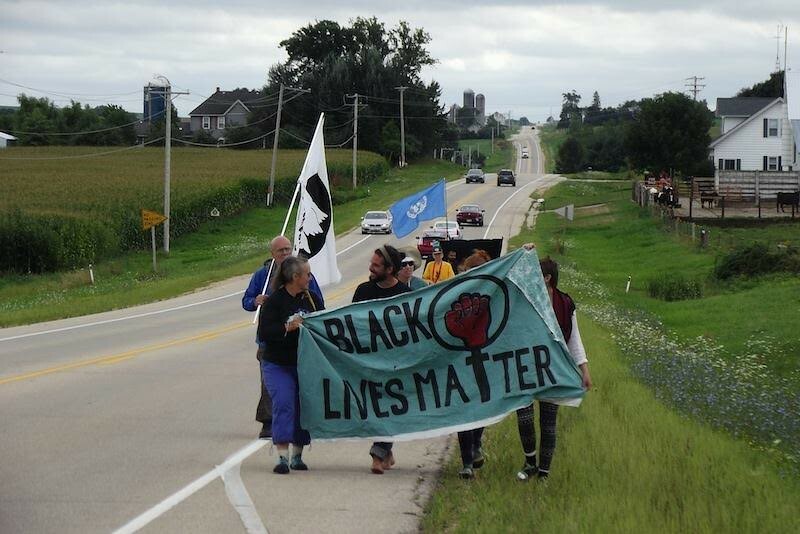 This past summer, collaborating with Wisconsin activists, we decided to feature this refrain on signs and announcements for a 90-mile walk campaigning to end targeted drone assassinations abroad, and the similarly racist impunity granted to an increasingly militarized police force when they kill brown and black people within the U.S. Walking through small cities and towns in Wisconsin, participants distributed leaflets and held teach-ins encouraging people to demand accountability from local police, and an end to the "Shadow Drone" program operated by the U.S. Air National Guard out of Wisconsin's own Volk Field. Our friend Maya Evans traveled the furthest to join the walk: she coordinates Voices for Creative Nonviolence in the UK. Alice Gerard, from Grand Isle, NY, is our most consistent long-distance traveler, on her sixth antiwar walk with VCNV. Brian Terrell noted what mothers speaking to CODEPINK, as part of the Mothers Against Police Brutality campaign, had also noted: that surprisingly many of the officers charged with killing their children were veterans of the U.S. wars in Afghanistan and Iraq. He recalled past national events, such as the NATO summit in Chicago, in 2012, whose organizers tried to recruit temporary security officers from amongst U.S. veterans. Former soldiers, already traumatized by war, need support, healthcare and vocational training but instead are offered temp jobs to aim weapons at other people in predictably tense settings. The walk was instructive. Salek Khalid, a friend of Voices, shared “Creating a Hell on Earth: U.S. Drone Strikes Abroad,” his own in-depth presentation about the development of drone warfare. Tyler Sheafer, joining us from the Progressive Alliance near Independence, MO, stressed the independence of living simply, off the grid and consuming crops grown only within a 150 mile radius of one's home, while hosts in Mauston, WI welcomed Joe Kruse to talk about fracking and our collective need to change patterns of energy consumption. The ability to withhold our money and our labor is an important way to compel governments to restrain their violent domestic and international power. We weren't alone. We walked in solidarity with villagers in Gangjeong, South Korea, who'd welcomed many of us to join in their campaign to stop militarization of their beautiful Jeju Island. Seeking inter-island solidarity and recognizing how closely they share the plight of Afghans burdened by the U.S. "Asia Pivot," our friends in Okinawa, Japan will host a walk from the north to the south of the island, protesting construction of a new U.S. military base in Henoko. Rather than provoke a new cold war, we want to shine light on our common cares and concerns, finding security in extended hands of friendship. On August 26th, some of the walkers will commit nonviolent civil resistance at Volk Field, carrying the messages about drone warfare and racial profiling into courts of law and public opinion. Too often we imagine that a life swaddled in everyday comforts and routines is the only life possible, while half a world away, to provide those comforts to us, helpless others are made to shiver with inescapable cold or fear. It's been instructive on these walks to uncoddle ourselves a little, and see how our light shines, unhidden, on the road through neighboring towns, singing words we've heard from children learning to be as adult as they can be; attempting to learn that same lesson. The lyric goes “I'm not going to make it shine: I'm just going to _let_ it shine. We hope that by releasing the truth that's already in us we can encourage others to live theirs, shining a more humane light on the violent abuses, both at home and abroad, of dark systems that perpetuate violence. On walks like this we've been fortunate to imagine a better life, sharing moments of purpose and sanity with the many we've met along the road.